4 W - 7050 TO 7130 kHz with Ceramic Resonator. This page contains only schematics who speak for themselves. Hieronder volgt één van mijn grotere projecten die ik uitgevoerd heb. Het betreft hier een 40 meterband SSB zend-ontvanger (tranceiver) Van 7.050 tot 7.140 Mhz. De ombouw van mijn 40 meterband transceiver van een analoog VFO naas DDS. The transceiver described here is remarkably simple based on popular communication building block MC1496. It is fairly simple to build because most of the functions are performed by MC1496. Trata-se de um transceptor que tem algumas novidades, foi um misto de bitx com ararinha, juntando o que se tem de melhor e simples em cada projeto, com pequenas modificações. After building the BITX, we rethink the project with integrated circuits and arrive at a surprising result. With few components we develop a simple and efficient transceiver. A simple transceiver QRP of SSB, with 4 Watts of output power for 40m. ARARINHA 4 is an evolution of project ARARINHA that it looks to be a simple radio, cheap and efficient for SSB. The components of the assembly of the radio are of easy acquisition in the Brazilian market and in we look them to place minimo of components to facilitate the assembly. 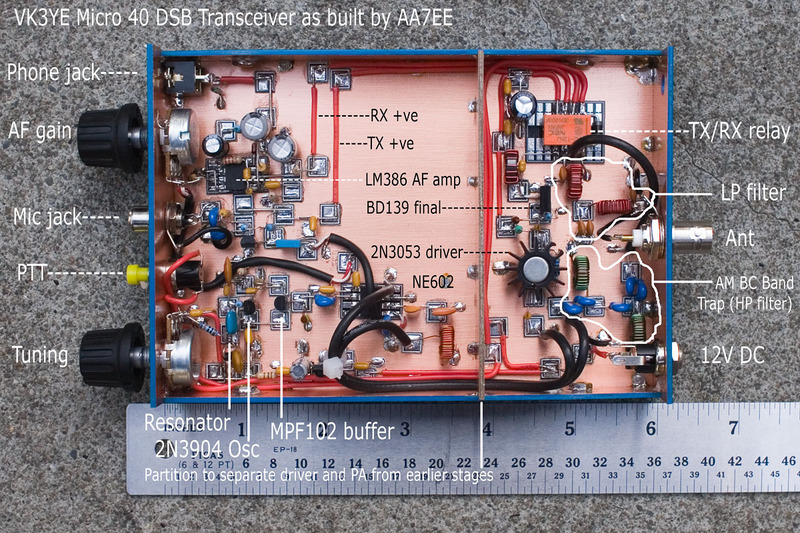 The 'Beach 40' is a simple yet practical voice transceiver for the 7 MHz amateur band. Go any simpler and it's hard to get contacts. 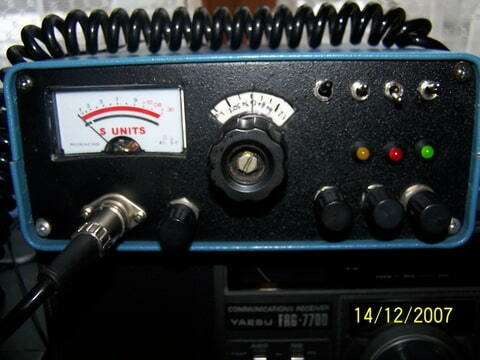 This is the great transceiver used by our friends of South Brazil. They built 18 rigs like that (november 2004). Because the strong signal , stability and audio quality we talk to Jair, about the circuit, mainly looking for the VXO design and he kindly send us the schematic. JUMA-TRX1 is a direct conversion HF transceiver based on the previous JUMA-RX1, JUMA-TX1, JUMA-KEYER1 projects. It is driven by a stable DDS VFO. The 'Knobless Wonder' is a simple fixed frequency SSB voice transceiver for the 7 MHz amateur band. It is basically the IF and audio end of a BitX. O Maritaca tem 8 Watts de potência de saída, podendo chegar aos 12W dependendo da tensão de alimentação. Toda a recepção foi derivada do projeto do Jair pois tem um rendimento excelente. 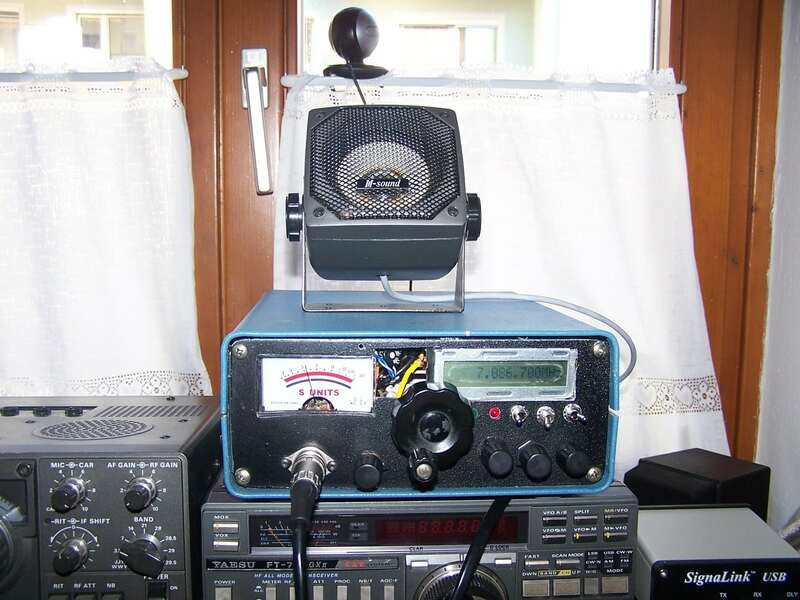 The 'Micro 40' is a simple DSB voice transceiver for the 7 MHz amateur band. A single NE602 forms both the transmitter's balanced modulator and the receiver's product detector. In my might a DSB Pixie is a big challange, knowing that I had excellents results from a CW Pixie and a chance to study a DSB modulation. We come again to internet and collet more informations, now about SSB and DSB. At this point of course, I was committed, and set about building what I hoped would be the first DSB rig I’d build from scratch that would actually work. I have made a few changes to VK3YE’s schematic, and will describe them here.